Bacillus stearothermophilus phosphofructokinase. 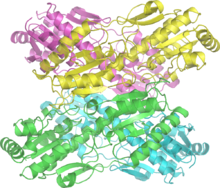 PDB: 6PFK​. Glucokinase (GK) is an enzyme that helps in the glycolytic pathway by phosphorylating glucose into glucose-6-phosphate (G6P). It is an isozyme of hexokinase and is found mainly in pancreatic β cells, but also liver, gut, and brain cells where glycolysis cause glucose-induced insulin secretion. Glucokinase activator lowers blood glucose concentrations by enhancing glucose uptake in the liver and increasing insulin production by the pancreatic β cells. Due to this, Glucokinase and glucokinase activators are the focus of treatment for those with type 2 diabetes mellitus. Glucokinase have a single allosteric site where the glucose-regulating protein (GKRP) binds in the nucleus of the cell in its inactive form when there is a low concentration of glucose present in the cell. However, when the glucose concentration of the cell increases the glucokinase-GKRP complex breaks apart and GK proceeds to the cytoplasm where it then phosphorylates glucose. Glucose when abundant in cells acts as an enzyme activator for glucokinase. Glucokinase activation in the β cells and liver cells results in the uptake of glucose and production of glycogen. This activation in the β cells leads to insulin secretion, promoting glucose uptake storing it as glycogen in the muscles. ^ Chen G, Zhang Y, Liang J, Li W, Zhu Y, Zhang M, Wang C, Hou J (February 2018). "Deregulation of Hexokinase II Is Associated with Glycolysis, Autophagy, and the Epithelial-Mesenchymal Transition in Tongue Squamous Cell Carcinoma under Hypoxia". BioMed Research International. 2018: 8480762. doi:10.1155/2018/8480762. PMC 5841093. PMID 29682563. ^ a b Park K, Lee BM, Hyun KH, Han T, Lee DH, Choi HH (March 2015). "Design and Synthesis of Acetylenyl Benzamide Derivatives as Novel Glucokinase Activators for the Treatment of T2DM". ACS Medicinal Chemistry Letters. 6 (3): 296–301. doi:10.1021/ml5004712. PMC 4360162. PMID 25815149. ^ Lenzen S (May 2014). "A fresh view of glycolysis and glucokinase regulation: history and current status". The Journal of Biological Chemistry. 289 (18): 12189–94. doi:10.1074/jbc.R114.557314. PMC 4007419. PMID 24637025.